How to cite BASS data ? From May 2011 to April 2013, 24 broadband stations were deployed from southern Victoria to northern Tasmania to illuminate the 3-D structure of the crust and lithosphere beneath the Bass strait. The BASS experiment was undertaken under a collaborative effort of several organizations including The Australian National University, the University of Tasmania, FROGTECH, Geological Survey of Victoria, and Mineral Resources Tasmania. 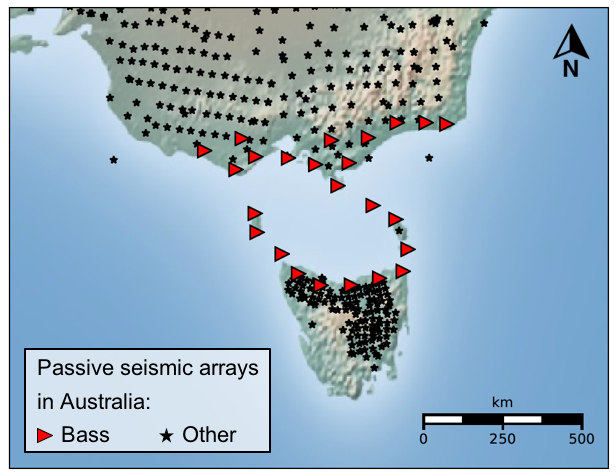 The seismic data recorded during the BASS experiment consist of approximately two years of ambient seismic noise continuously recorded at 24 stations located in northern Tasmania, several islands of the Bass Strait (King Island, Deal Island and Flinders Island) and southern Victoria. The microseisms occuring in the Bass Strait and the influence of the Southern Ocean provided a vigorous and relatively consistent distribution of noise sources during the experiment. Guralp CMG-40T seismometers were used with Earth Data digitizers at a sampling rate of 50 Hz.